Spirit Week is Jan 22 - 25! Spirit Week will begin Tuesday, Jan. 22 and increase in excitement through Homecoming on Friday, January 25! Each campus will be showing their school spirit with themed dress up days, pep rallies, and friendly competition! Here's what to look forward to. 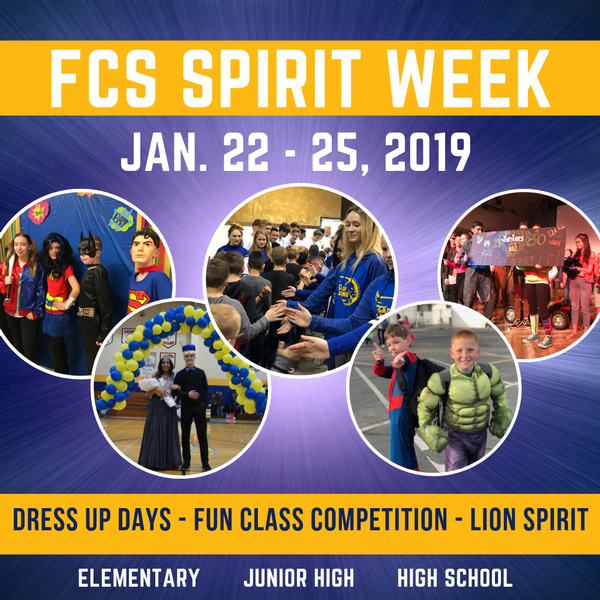 Our elementary campus will be kicking off the fun with a pep rally on Tuesday afternoon followed by themed dress-up days! The class with the most participation each day will win a treat! Our 7th and 8th grade students will be competing as Ninjas vs. Pirates which will include hallway decor, themed dress-up days and rally game contests. The winner of Junior High Spirit Week will be announced during their rally on Friday. Our high school theme for 2019 is "Superhero Movies" with each class presenting the Marvel or DC blockbuster they have selected! As is tradition, the classes will be competing in hallway decor, themed dress-up days, rallies, selling of spirit chains, posters and skits. The highly sought-after Spirit Trophy will be awarded to the class with the most points on Friday after the Boys Varsity Basketball game. * Hallway decor viewing opens at 7:45am on Tuesday! And the big finale of Spirit Week is FCS Homecoming! The festivities will begin at 5:45pm just before tip-off of the Varsity Girls game! The night will include FCHS Cheer, Lions Pep Band, Alumni Prize Drawings, and announcements of the FCHS Spirit Week competition. Our Lady Lions will take to the court at 6:00pm vs. the Saints followed by the induction of two FCHS Alumni into our Athletics Hall of Fame. Our Varsity Boys take on Cristo Rey at 7:30pm with a special halftime performance by our FCHS Cheerleaders and FCS Lion Band! 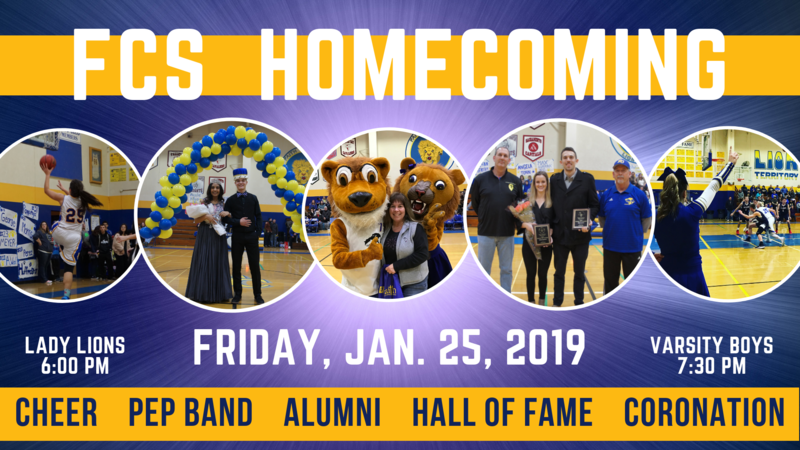 Following the games will be the presentation of the spirit chains money to the Thomas family, Spirit Trophy, and Homecoming Court Coronation with the crowning of our new Homecoming King and Queen! All FCS family and friends are welcome to join in the fun. Wear blue and gold and come cheer for your FCS lions!